Japanese mentality as well. I got accompanied by Chinami and we went for sushi afterwards before heading towards the famous Expo park of the year 1970. The park is huge, well refined and especially the Japanese garden is worth a visit. As part of the cooperation with the Goethe Institution Osaka I spent one day as an actor for the yearly produced advertisement videos. During the day I was able to get to know new people and friendships developed. While doing the clips I figured out that learning a foreign language is not common in Japan which is why a lot of political and cooperational Engagement is necessary to introduce the advantages of a new language to the people. 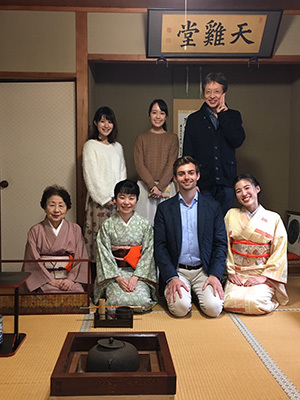 Furthermore, I was able to learn a lot about the work environment in Japan as well as its influence on the travel and vacation habits of Japanese people. The established structures have a significant influence on how the locals address holidays and their setting towards foreign nationalities. When asking locals about their favourite season, most of them mention fall even still ahead of the cherry blossom. In order to experience the colourful event, I spent the three days in Kyoto and visited several gardens and parks. Even though not all leaves have changed in colour, yet it is absolutely amazing how colourful and different spring is in Japan in comparison to Europe. This in mainly caused by the different temperatures here as well as different type of trees and plants in Japan. In my opinion, the local maple looks the best when lit by the sun. since several sightseeing locations announced admission control and preregistration which primarily affects the locals who are used to have free access. It also seems like spring is a time where Japanese people take especially care of their culture and invite for evening activities and celebrate this time of the year. example, the alternate use of very sweet Japanese sweets followed by bitter Japanese green matcha tea supported my opinion of Japan being the country of contrasts. decades. In the evening I was invited to join dinner at Mrs. Ikawa’s house together with the fellow group members. We had a lot of fun and used the day to share each other’s culture and learn from each other.